Goldman Sachs was paid a quarter of a billion dollars to raise money for Malaysia’s notorious 1MDB fund in a deal that would normally generate some $1.3 million in fees and carried little risk because much of the bond was already sold, according to an explosive new book. Billion Dollar Whale, The Man Who Fooled Wall Street, Hollywood, and the World says that the some of 1MDB’s board seemed sceptical at the $US190 million ($250 million) Goldman Sachs wanted – which the authors call an “outrageous sum” – and even the investment bank’s president of Asia, David Ryan, thought the amount was excessive. A portion of the book leaked to The Australian Financial Review asserts Goldman Sachs, which is now the target of the US Justice Department investigation over the 2012 deal, structured the transaction to generate windfall profits with little risk. The book is due out September 18. Alex Turnbull, left – seen with wife Yvonne, parents Malcolm and Lucy, and his daughter Isla – raised concerns about profits at Goldman Sachs. Billion Dollar Whale is written by Tom Wright and Bradley Hope, two Wall Street Journal reporters who broke many of the major stories about the alleged loss of $US4.5 billion through 1MDB, a development fund established by the Malaysian government. The book could add to Goldman’s embarrassment at profiting from a fund that the new Malaysian government alleges was part of a corrupt scheme involving former prime minister Najib Razak, who was arrested in July. He has pleaded not guilty. The US government has previously sought paintings, properties, movie rights to The Wolf of Wall Street, a 91-metre yacht and diamond jewellery given to model Miranda Kerr, which it alleges were paid for with money plundered from the fund. Separate investigations are also under way in Singapore, Switzerland, Britain, Hong Kong, Thailand, Luxembourg and the United Arab Emirates. 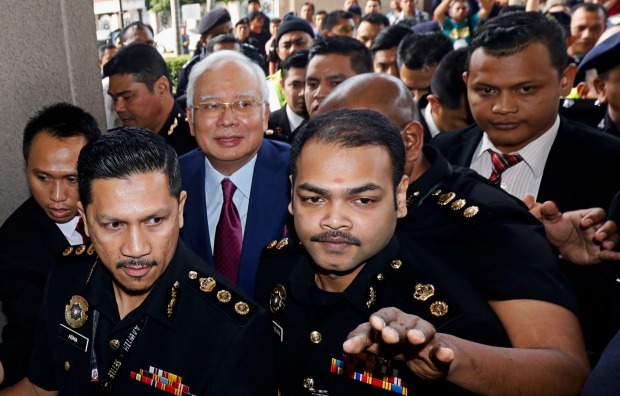 Malaysia’s former prime minister Najib Razak pleaded not guilty to being part of a corrupt scheme after his arrest in July. 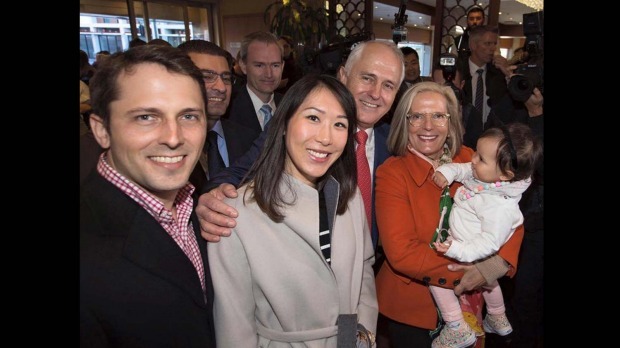 When Malcolm Turnbull’s son Alex, a Goldman Sachs banker in Asia who wasn’t working on the deal, raised concerns about the bank’s profits in an internal email, he was disciplined by Goldman’s compliance department, according to the book. Goldman Sachs has previously said that it can’t find an electronic record of Mr Turnbull raising concerns about the deal and said no action was taken against him. 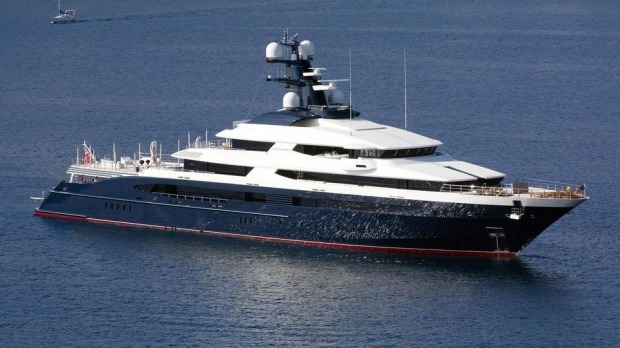 The Equanimity, which the US alleges was bought using money stolen from 1MDB. The deal was structured to allow Goldman Sachs to buy all of a $US1.75 billion bond at a steep discount from 1MDB. Goldman made its profit by onselling the debt at face value. Finding buyers wasn’t hard. The government-guaranteed bond paid 6 per cent interest at a time rates across the region were close to zero. Also, Goldman had already lined up buyers in Japan, South Korea and the Philippines. Further reducing Goldman’s risk, 1MDB had bought power stations from a Malaysian company that had in turn agreed to buy a “significant” portion of the bonds, the book says. “Despite some questions, the board, filled mainly with Najib loyalists, was ultimately a rubber stamp and it wasn’t going to mount a serious attempt to stop this plan in its tracks,” the book says. After the bond was sold, Mr Najib decided 1MDB need to raise another $US3 billion, the book says. At a meeting at the World Economic Forum in Davos, Switzerland, Mr Najib met with Goldman’s vice-chairman for “growth markets”, Michael Evans. The prime minister allegedly asked if the bank could raise the money quickly and quietly. “Of course, Goldman would be more than willing to help out, Evans replied,” the book says. As soon as Goldman raised the $US3 billion, $US1.2 billion was “purloined” into a British VIrgin Islands company, the book says. Goldman’s total fees from 1MDB are reported to have been about $US700 million. “The bank had turned a blind eye to irregularities, enabling the kind of industrial-scale corruption carried out in the past by Sani Abacha of Nigeria or Ferdinand Marcos of the Philippines,” the book says. A spokeswoman for Goldman Sachs declined to comment. The bank has previously said it raised the money in good faith and wasn’t responsible for what it was spent on.